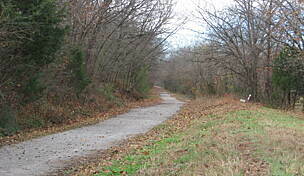 The Frisco Highline Trail, running 36 miles between Springfield and Bolivar, is Missouri’s second longest rail-trail. On the abandoned corridor of the Burlington Northern, the route travels through the towns, farmlands and rolling hills of the Ozark Plateau, featuring 16 bridge crossings and a ride through the beautiful La Petite Gemme Prairie. 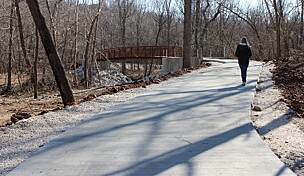 The Frisco Highline Trail (FHT) is administered by the non-profit organization Ozark Greenways, which began converting the rail corridor in 1993 and completed the final miles linking the trail to Bolivar in 2005. 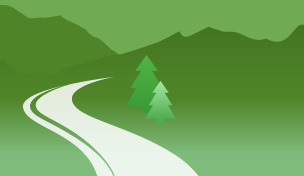 Their website provides useful information on annual trail events and current conditions. We offer a two-day itinerary beginning and ending in Springfield. Some recreationalists may opt to cycle the 70-round trip miles in one day, while others will choose to stay overnight in Bolivar. Both options are doable as small towns and services are conveniently located along the route. Hybrid bikes are useful on the FHT’s mixed surface of asphalt and crushed gravel. The bulk of the trail, 23 miles, is stone and dirt and can get muddy and rutted after heavy rains. There are two paved sections at the north and south ends of the trail and a short on-street connection two miles south of Bolivar. The southern-most trailhead of the Frisco Highline Trail is located between Springfield’s historical downtown district and the Springfield-Branson National Airport, roughly 5 miles in either direction. The trailhead is on a city bus route and buses are able to accommodate two bikes on their front racks. There is also a signed on-street bike route connecting the trailhead to downtown. In Springfield, the Courtyard Marriott and La Quinta Inn & Suites are the closest overnight accommodations to the trailhead, located a quarter-mile east of it on W. Kearney Street. If you prefer to be closer to downtown with its shops, restaurants and attractions at your fingertips, there are certainly plenty of additional lodging options. Walnut Street Inn, a boutique hotel/bed & breakfast in the historical Walnut Street district is a good choice for its central location, Queen Ann Victorian architecture and charming blend of the historic and the modern. Within a mile of the inn are many of Springfield’s major historic and cultural attractions such as the historic route 66, Battle of Springfield walking tour, History Museum on the Square and the historic Gillioz Theatre. 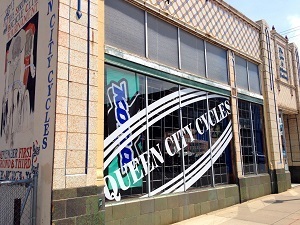 Also nearby on Walnut Street is Queen City Cycles , a full-service bike shop and good place to get tips on local bike routes and riding. While here, stop at the neighborhood Bistro Market to stock up on food and drinks for the trail. The railroad arrived in Springfield in 1870, bypassing what was then “old” Springfield to lay tracks about a mile north in the “new” town of North Springfield. Today, this area—a six-block registered historic district— is known as Historic C-Street, referring to the commercial ventures that sprang up around the freight and passenger rail depot. 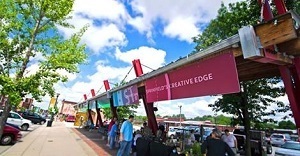 It is a fun place to explore, with its shops, restaurants, lofts and seasonal C-Street City Market. 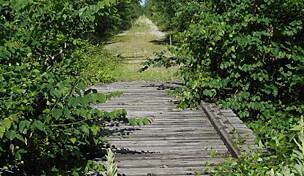 The FHT runs on the old rail corridor of the St. Louis-San Francisco Railway, commonly known as the Frisco. For more than a hundred years, until the Frisco merged with the Burlington Northern Railroad, the Frisco rail lines spread throughout the Midwest and south-central states (it never reached San Francisco) and its main hub was in Springfield. Several rail cars, including the Frisco 4524 steam locomotive, can be seen at the Railroad Historical Museum at Grant Beach Park, one-half mile south of W. Commercial Street. From Springfield, the first 8 miles of the Frisco Highline Trail are paved and cut through a landscape of industrial buildings, suburban neighborhoods and agricultural land. Heading northwest, you cross U.S. Highway 160 at mile 3 to parallel the highway for the remaining three miles to the community of Willard. By the time you get to Willard’s trailhead (mile 6), fast food chains and eateries start to pop up on W. Jackson Street, the primary road running through town (which the trail parallels for 2 miles). On the north end of town, you have another chance for food and drinks; at the junction of Highway 160 and 123 (mile 8) there is a local diner, Junction Café, and a gas station/convenience store. From here, the pavement ends and the FHT runs alongside Highway 123 for 7 miles heading northward toward Walnut Grove. Surrounding the trail are farmlands and fields; keep an eye out for the wildlife that live in this rural landscape, such as deer, fox, skunks, rabbits and squirrels. Back in the day, possums were so prevalent in this area that the next town, Walnut Grove (mile 16), was initially named Possum Trot. Walnut Grove hosts an annual celebration in September called ‘Possum Trot Days’ to remember this heritage. There is no guarantee you will see a possum today, but you can find water and restrooms at a convenience store in town, a mile detour off-trail at the junction of E. Main Street and Highway 123. Also, bluegrass aficionados may want to time their ride through Walnut Grove during the annual Pickin in the Park festival, the second Saturday in June. Beyond Walnut Grove, the trail leaves the highway and begins a gradual downhill stretch to the Sac River. 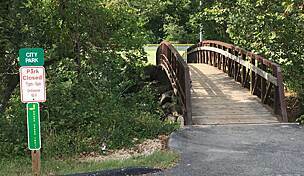 The first of 16 bridges, Hobo Haven Bridge, is at mile 18.5. The bridges on the FHT range in length from 38 to 317 feet with varying surfaces of wood planks, metal plates and concrete. You cross the Little Sac River at mile 23 to begin the climb back out of the river bottom. Wishart (mile 24.5) is a small rural community named after Dr. Wishart, a general passenger agent who once worked for the Frisco railroad. There are no services here except a port-a-potty at the trailhead. 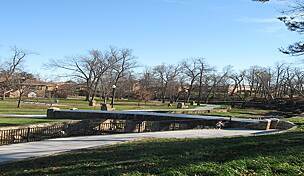 Just beyond the town is the longest bridge of the Frisco Highline Trail, the Highline Bridge. At mile 31, the trail returns to pavement and remains asphalted to Bolivar. La Petite Gemme Prairie, at mile 32, is a remnant of the native tallgrass prairies that once covered much of Missouri. The route passes through this 37-acre grassland whose name in French means “the little gem.” For many, this prairie is a precious gem of natural beauty, particularly when wildflowers burst open in their colorful display. The prairie, managed by the Missouri Prairie Foundation and the Missouri Department of Conservation, is also home to many birds and critters including upland sandpipers, scissor-tailed flycatchers, coyotes, legless lizards and ornate box turtles. Take your time wandering through the prairie as the end of the trail comes all too soon. At mile 33, in fact, the trail stops at Highway 13 and you ride on-road for 2.5 miles. 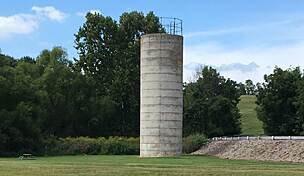 Take Prairie Lane north to W. Aldrich Road. If you plan on staying overnight in Bolivar, continue straight on S. Wommack Avenue for a half mile to Super 8 or Comfort Inn. To continue to the trailhead, follow W. Aldrich east for 1.2 miles until the paved trail resumes to take you north. 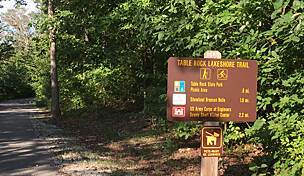 From here, you have another mile to the Bolivar trailhead with paved parking, a covered picnic area and restrooms. The Frisco Highline’s northernmost trail terminus is a mile west of historic downtown Bolivar Square; to get there, head east on W. Broadway Street. Right off the bat you will see the Korean Oseyo Restaurant which serves up Asian fusion cuisine. At Main Street, there are shops, cafes, and coffee shops and another restaurant with a menu from farther afield, Main Street Mediterranean Cuisine. 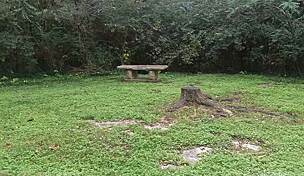 Before you begin your return trip, you may want to visit Dunnegan Memorial Park, about a mile north of Bolivar’s historic downtown area. 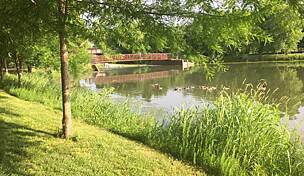 It’s a beautiful place to wander with nature trails, a small lake and its own resident swans and peacocks. On the way to the park, you’ll see Polk County Museum, home to the county’s historical and genealogical society (a good place to learn the scoop on the town’s association with the Venezuelan liberator Simón Bolívar) and Dunnegan Gallery of Art which showcases contemporary and western art. While you’re exploring the city, grab a hearty breakfast and enjoy your ride back to Springfield.